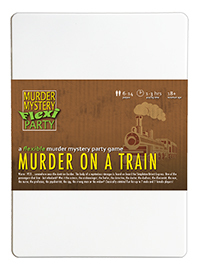 You've been invited to play the role of Doctor Sawders in Murder on a Train. In the coldest month of 1933, somewhere near the Austrian border, passengers aboard the Simpleton-Orient Express experience a murder that will change their lives forever! But who killed mysterious stranger John Doe? Join us to find out whodunit! Nothing says ‘doctor’ more than a white coat and a dreamy bedside manner and you have both. Underneath the coat you wear a tweed suit and bow tie, complete with a stethoscope and a pocket full of tongue depressors. You are an excellent doctor - skilled, knowledgeable, approachable. You also have a tendency to panic in times of crisis, which is why you are no longer allowed in the operating theatre. Or the delivery ward. Or anywhere there is any threat to life. Lucky then that you work as a GP in a sleepy English village. Good day, I’m Doctor Sawders. I’ve just attended a conference in Paris on dangerously infectious epidemics and am now traveling to Constantinople for a lecture on personal hygiene - my wife hates the smell of train travel on me. I want to reassure you that Mr Doe’s sudden death is almost certainly not contagious, but we probably shouldn’t leave this carriage for about 2-3 hours, just to be on the safe side. Also, anyone who coughs will be placed in quarantine.